There are a lot of kitchen sink beers out there, mixing trendy or oddball ingredients with the hope that it will work. Sometimes it does, to majestic effect. 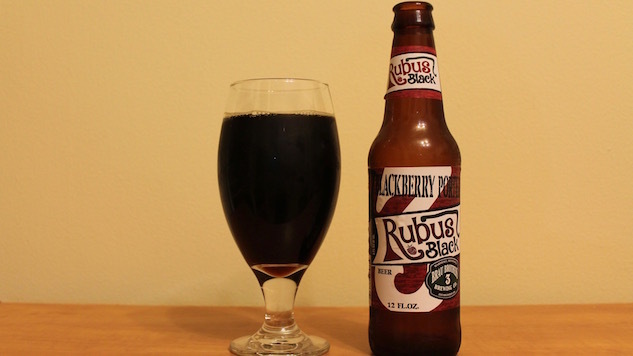 In 2006, Brau Brothers Brewing Co. made the first batch of Rubus Black, an imperial blackberry porter brewed with an addition of both chocolate and blackberries to an already strong porter. Since then, the beer has become a random brew, making occasional appearances over the years, most recently surfacing in six-packs in parts of Minnesota, South and North Dakota, Iowa, and Wisconsin. It’s dark in pour, almost black with a reddish undertow, while the blackberry dominates the nose. Underneath those berry fumes is the presence of a caramel malt body and a hint of alcohol aroma, but the berries lead the charge in introducing the beer—and ultimately carry the flavor impressions as well. That’s a lot of dessert descriptors, but Rubus Black also packs a wallop with a strong malt presence and the high 8.5% ABV, making it more of a winter imperial than a patio-side frolic. While it’s nice to drink it in early fall, it would also do well with a few months in the cellar to be cracked on Valentine’s Day. Brewery: Brau Brothers Brewing Co.